Fantasy Football: QB Start/Sit Rankings (Week 4) - Fantasy Football, Fantasy Football Rankings | Mac Bros. Here they are—Fantasy Football Quarterback Rankings for Week 4 (2010) to help you decide who to start and who to sit on your fantasy football team. 1. Peyton Manning (IND) - He has been dominate through his first 3 games and Manning will likely continue the trend with an ultra favorable week 4 match up against Jacksonville. The Jaguars defense has been among the NFL’s worst so far this season in defending the pass ranking 29th. In addition, Manning has absolutely torched the Jags in his last 2 trips to Jacksonville combining for 672 passing yards, 7 TDs and just 1 interception. 2. Aaron Rodgers (GB) - It’s fair to say that Rodgers has owned the Lions throughout his career. In his last 4 games versus Detroit, he has yet to throw for less than 300 yards while racking up 11 TD passes to just 1 interception. The Detroit pass defense once again is among the league’s bottom dwellers, so you can expect more of the same from Rodgers against the Lions in 2010. 3. Drew Brees (NO) - While he has been somewhat hit or miss against the Panthers throughout his career, at least by Drew Brees standards anyway, we like his chances for success this time around. The Carolina pass defense may be a little better than advertised, but they have allowed 6 TDs through the air in 3 games while allowing 10 pass plays of 20 yards or more during that span. The Panthers also have just 2 sacks to their credit so far in 2010. Brees is said to be battling soreness in his knee, but he is not listed on the injury report and should be fine for Sunday. 4. Phillip Rivers (SD) - In spite of his 4 interceptions, Rivers has been one of fantasy football’s top and most consistent scorers at the QB position through the first 3 weeks. A trend that will likely continue in week 4 at home against a fairly generous Arizona pass defense. The Cardinals have yet to face a QB of River‘s caliber and while he does need to cut down on his interceptions, Rivers should be considered a must start QB1 with this match up. 5. Tom Brady (NE) - The 2010 Dolphins pass defense looks fairly solid on paper thanks largely to facing an anemic Bills passing attack in week 1, in addition to a struggling Vikings passing game in week 2. That said, the Fins may have revealed their true colors in week 3 allowing Mark Sanchez to throw for 256 yards and 3 scores. While Brady threw just as many interceptions as he did TDs against Miami in 2009, he did not throw for less than 332 yards in 2 games against them and he is more than capable of exceeding Sanchez’s numbers in week 4. 6. Michael Vick (PHI) - The reigning NFC player of the month continues to torch opposing defenses and seemingly gets better by the week. Even better, he will face a Redskins defense in week 4 that has struggled mightily thus far against the pass allowing 326 passing yards per game. It would not be a surprise if Vick is amongst fantasy football’s top scorers once again with this match up. 7. Matt Schaub (HOU) - He will face an Oakland pass defense in week 4 that currently ranks 2nd in the NFL. Fortunately, that ranking is a bit of a mirage considering the caliber of QB the Raiders have faced through the first 3 weeks and the fact that most teams prefer to run against the very generous Oakland run defense. The Raiders have allowed 6 TDs through the air which bodes well for Schaub and from a difficulty standpoint, Schaub easily outmatches this defense. Unfortunately, we do think his success could be limited to some degree by the Texans likely preference to continue the trend of run over pass against this defense, especially with Andre Johnson gimpy with an ankle injury. 8. Matt Ryan (ATL) - With 5 TD passes and 0 interceptions in his last 2 games, Ryan is starting to heat up. He should keep things rolling with a favorable home match up against a struggling San Francisco defense that has allowed 7 TDs through the air in their first 3 games, including 3 to Matt Cassel in week 3. Ryan should be solid in week 4 against the road weary 49ers. 9. Jay Cutler (CHI) - Cutler will face a Giants pass defense in week 4 that currently ranks 4th in the NFL. At first glance this seems like a tough match up and given Cutler’s Jekyll and Hyde history, it could very well turn out to be just that. The silver lining is that in the Giants first 3 games, they have faced just one relevant QB in Peyton Manning and Manning lit them up for 3 TDs. While Cutler is not Peyton Manning, he is capable of putting up big numbers against this defense barring a colossal meltdown. 10. Chad Henne (MIA) - Henne may not be the most reliable fantasy option most weeks, but there is plenty to like in week 4. He is coming off of a very impressive game against a Jets defense that is one of the best in the NFL even without Darelle Revis. It appears Henne is starting to click with Brandon Marshall and that could spell big trouble for a young and struggling Patriots secondary. The New England pass defense has been among the league’s worst so far this season allowing 7 TD passes in three games (5 of which came against Mark Sanchez and Ryan Fitzpatrick). In addition, Henne threw for 335 yards and 2 TDs against a much better Pats pass defense in Miami last season. 11. Kyle Orton (DEN) - With the aid of a surprisingly solid cast of receivers, Orton is averaging 359 passing yards per game through the first 3 weeks and he’s developing into one of the better fantasy options at the QB position this season. The bad news is that Orton will face his biggest test so far this season against a Titans pass defense that has allowed just 1 TD pass all season while giving up an average of 178 passing yards per game. The good news is that Tennessee gave up 386 passing yards to Eli Manning in week 3 and they were never challenged by sub par QBs Jason Campbell and Dennis Dixon in the first 2 weeks, so the Titans numbers against the pass are a bit skewed. 12. Eli Manning (NYG) - He will face a Bears pass defense that has given up an average of 279 passing yards per game ranking them just 28th in the NFL through 3 games, yet they have allowed only 2 passing TDs and have 4 interceptions. When you consider the fact that the Bears have faced Tony Romo and Aaron Rodgers in their last 2 games, those numbers aren’t bad. 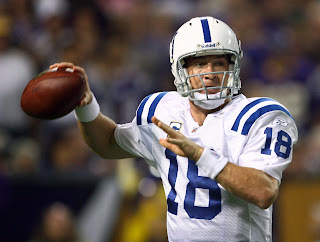 Manning will have a tough test against Chicago and this match up is far from fail safe, but he has the weapons to do some damage so long as he can avoid the mistakes that have plagued him recently. 13. Carson Palmer (CIN) - Palmer has been pretty lousy to this point and while he is making it increasingly difficult to trust him as a fantasy option, it seems unlikely that he can screw up too badly against Cleveland. After all, Joe Flacco was lousy in his first 2 games as well and the Browns made Flacco look like Peyton Manning in week 3. So, there is hope for Palmer, at least this week anyway, but if he does manage to screw this one up; it may be time to cut your losses. There is simply no excuse for Palmer’s lack of production with his arsenal of weapons. 14. Bruce Gradkowski (OAK) - Fantasy football’s elite, he is not, but a favorable week 4 match up against Houston holds promise. Gradkowski has decent ability and combined with a dangerous cast of weapons, he should be in for a solid day against a very generous Texans pass defense that ranks dead last in the NFL. Through 3 games, Houston has allowed 369 passing yards per game, 6 TDs and have 0 interceptions to their credit. Gradkowski has sleeper written all over him for week 4. 15. Mark Sanchez (NYJ) - He has been on fire the last 2 weeks with 6TD passes to his credit and 0 interceptions. In week 4, Sanchez will face a familiar Buffalo pass defense that totally embarrassed him in each of their 2 match ups in 2009. The good news is that the Bills pass defense has regressed so far in 2010 and can best be described as mediocre while Sanchez‘s stock is clearly on the rise. So logically, his chances for success against Buffalo are much better this time around. That being said, there is still room for skepticism with this match up. 16. Matt Hasselbeck (SEA) - While we like the match up against a shaky St. Louis defense in week 4, it is still difficult to imagine him putting up monster numbers. A solid day is not out of the question, but it is certainly not a foregone conclusion either. 17. Donovan McNabb (WAS) - He is still a very capable fantasy QB, but his chances for success in week 4 are iffy in our opinion. The Eagles already have 12 sacks to their credit in just 3 games in addition to a solid secondary. McNabb may surprise, but it’s going to be tough sledding in this homecoming and there are certainly safer week 4 fantasy options at QB. 18. Sam Bradford (STL) - A favorable match up against Seattle’s 30th ranked pass defense could yield decent numbers for the rookie. He may not be a serviceable week to week fantasy option just yet and he is not going to wow you, but you could do far worse than Bradford in week 4. 19. Alex Smith (SF) - A new offensive coordinator should help Smith get things going in the passing game, but his struggles on the road so far leave plenty to be desired and Atlanta is a long way from San Francisco. Even against a beatable Falcons pass defense, Smith is a risky fantasy option for week 4. 20. Joe Flacco (BAL) - It was great to see him break out of his slump in week 3, but things could easily take a severe turn for the worse against a top flight Steeler defense in Pittsburgh. 22. Derek Anderson (ARI) - We can envision Anderson throwing the ball a lot in week 4, but that doesn’t necessarily make it a good thing against a solid San Diego pass defense. 23. David Garrard (JAC) - He has had success against Indy in the past, but given Garrard’s performances the last 2 weeks; he is difficult to trust against any defense. 24. Shaun Hill (DET) - He hasn’t been half bad while filling in for the injured Matt Stafford, but that could easily change in week 4 against a stout Green Bay defense. 25. Charlie Batch (PIT) - He was surprisingly productive in week 3, but we don’t expect that momentum to carry over to week 4 against Baltimore’s top ranked pass defense.